Enveloped, spherical. Diameter from 70 to 130 nm. Negative-stranded RNA linear genome, about 8.9 kb in size. Encodes for six proteins to 9 proteins. The viral RNA dependent RNA polymerase binds the encapsidated genome at the leader region, then sequentially transcribes each genes by recognizing start and stop signals flanking viral genes. mRNAs are capped and polyadenylated by the L protein during synthesis. 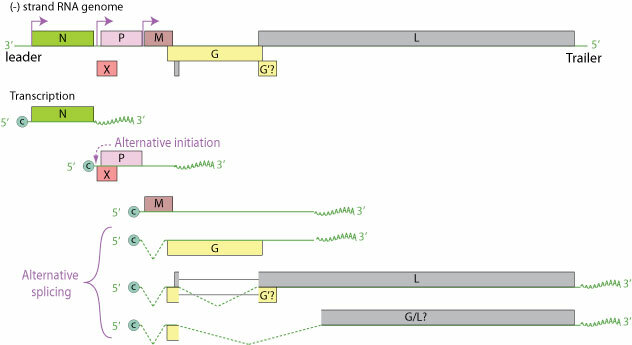 the third transcript encodes M, G and L by alternative splicing. 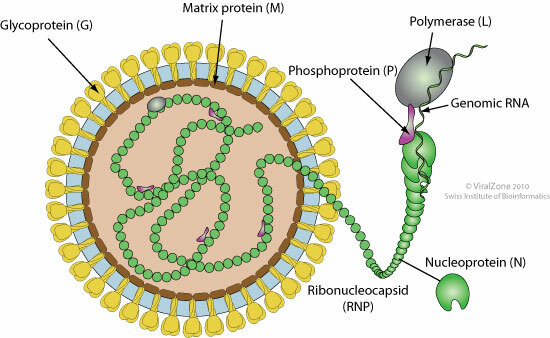 Fusion of virus membrane with the vesicle membrane; ribonucleocapsid is released and migrates to the nucleus. Sequential transcription, viral mRNAs are capped and polyadenylated by polymerase stuttering in the cytoplasm. M, G and L proteins are produced by alternative splicing. Neo-synthesized ribo-nucleocapsids exit out of the nucleus by nuclear pore export. Cytoplasmic ribo-nucleocapsids bind to the matrix protein under cell membrane, inducing particle budding. ETYMOLOGY Ortho: from greek, “true” as this is the first genus classified in the family. Bornavirus: from the Borna city in Germany, where many horses died from the BDV in 1885. NATURAL HOST Natural: Horses, sheep, cattle, rodents, birds. TROPISM Neurons and astrocytes. Oligodendrocytes and ependymal cells can be also infected. GEOGRAPHY Europe, North America, Africa and Asia. ASSOCIATED DISEASES Mammals Borna disease : fatal neurologic disease, restricted to Central Europe. Birds: encephalitis, proventricular dilatation disease(PDD). ANTIVIRAL DRUGS Ribavirin in cell culture.